Germany is set to transform its academic publishing to Open Access (OA). Gold OA model, where the articles are published in author-pays OA journals, is the obvious favourite, as recently recommended by several major universities and key German research institutions, the Max-Planck and the Helmholtz Societies. But also Green OA is welcome, where papers become openly accessible after an additional payment to the subscription publisher (hybrid model), or are uploaded to institutional depositories after this publisher’s embargo expires. The OA transformation is certainly a very laudable idea, however, a suspicion creeps in, there is possibly little strategy beyond the goal of flipping to OA. The closed-access Berlin12 conference on OA transformation, which took place in December 2015, did not seem to make cost reduction at publishing and subscriptions a priority, and neither changing the way science is published. Research irreproducibility, widespread manipulations and missing data, presently widely ignored or even cynically dismissed by journal editors, are probably expected to go away by themselves once the very same journals go full Open Access. Yet some scientists are keen to flip not only the subscription model to OA, but also the way science is published, towards transparency and data sharing. 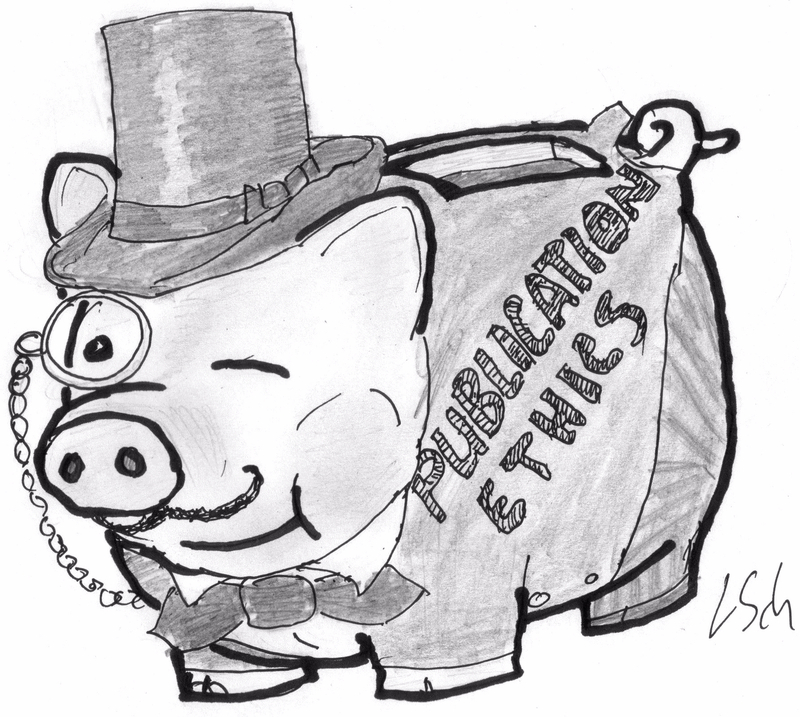 The traditional publishing model (whether subscription or OA), where a submitted manuscript disappears into a black hole of obscure editorial dealings, intransparent peer review and hidden conflicts of interests, only to emerge months or years later, with its experimental protocols muddy at best and its research data forever inaccessible- this should become a thing of the past. New models emerge, where the peer review becomes progressively transparent and the research becomes immediately available, for example as pre-prints. The Heidelberg-based academics Alexander Benjak and Alen Piljic had the idea to develop a web-based tool allowing scientists to make their ongoing research public, in a machine-readable form, which among other things, would improve reproducibility and cooperation. To get their project off the ground, Benjak, at that time editor with the journal FEBS Letters, and Alen Piljic, managing director at Life Science Network (LSN), decided to apply for funding with the most important German state funder, the DFG. They received some support from the biochemistry professor and FEBS Letters Editor-in-Chief Felix Wieland, who also offered them office space at the Heidelberg University Biochemistry Center, thus their proposed work would be integrated with one of the most important German universities. It was their third attempt to get their project funded, as they describe here. After their grant application was rejected, the two authors also made their original DFG proposal public. Benjak’s and Piljic’s project, named SPLICE, was afterwards also rejected by the European Commission call GARRI-4-2015, however, there it at least went through a proper peer review process. With DFG, the authors never had a chance. In fact, Pilijic’s and Benjak’s grant proposal was rejected by the DFG as ineligible right at the submission stage. SPLICE did not even reach peer review with DFG, as it seems, because Benjak and Piljic were simply not big or important enough to apply and help pave the way to Germany’s golden OA future. Their story seems to be one example for the often decried Matthew Effect in science funding: “For unto every one that hath shall be given, and he shall have abundance”. Or, as a somewhat rude German proverb goes: Der Teufel scheisst immer auf den grössten Haufen (The devil always shits on the biggest pile). “The Deutsche Forschungsgemeinschaft (DFG, German Research Foundation) invites proposals for the development and testing of new, possibly subject-specific approaches to open communication in research. […] The DFG funds experimentally oriented projects for the development and testing of new, innovative, and even risky approaches to introducing, designing and implementing open access, possibly in subject-specific ways”. “Our goal is to build a prototype of a novel web-native publication platform, with integrated data sharing and reviewing features, and a community-based reputation system. Building such a platform that addresses many of the open science target features simultaneously will help us anticipate potential friction points, eliminate them and bring us closer to the goal of an integrated and well-functioning scientific workflow. In addition, based on usage data and feedback, we aim to create a set of guidelines, a road-map towards open science, which should help decision makers in adopting policies to facilitate this transition”. “SPLICE project is the result of a discussion with John Lock, an associate professor at Karolinska, whom I met at a conference in Heidelberg back in 2013. Aleksander Benjak joined in later and helped with the concept and proposal writing. The project tries to address the question what open science is and how it could be implemented. Our goal was to build a prototype of a completely novel digital infrastructure for disseminating scientific knowledge and to provide a roadmap towards implementation of open science. The project seemed to be a perfect match for a DFG call entitled “Open access transformation”, which aimed to fund ideas dealing with upcoming challenges of open science transition”. Basically, DFG first decreed that the applicants must be long-term employed at a German university, and remain adamant: Piljic’ Life Science Network (LSN) was too small to apply for DFG funding (but not too small to offer the very same services to grant recipients commercially). “A funding application is not possible without an official employment at the University, which also includes the project period”. “In general not only permanently employed scientists, but also those with temporary contracts are entitled to apply for funding with DFG. […] In this specific case, the scientists working at the University of Heidelberg were in principle entitled to apply”. There was obviously some confusion inside DFG on Benjak’s status. Yet, because Benjak was originally warned by the DFG that he was not eligible due to his short –term contract with the University of Heidelberg, he suggested to Weihberg that Piljic could become the applicant who would later employ Benjak. This constellation would make LSN the main applicant, with Piljic dealing with DFG in his function as LSN director. “A participation of LSN would be only possible as external service provider. […] Not only LSN, but also at least one other company or organization, which is capable of performing the described tasks, would be required to submit an offer as attachment to the funding proposal. In the proposal you would specify which offer should receive preference and why, also how much funding you would require to pay for these services. […] A proposal modified in this way could be submitted anytime to the DFG funding program ‘Infrastruktur für elektronische Publikationen und digitale Wissenschaftskommunikation‘”. “Life Science Network gGmbH was founded in 2011 by Aleksander Benjak, Vibor Laketa and myself. The starting capital was 40.000 Eur. We chose the non-profit form, effectively donating that money, because we wanted to send a clear message that our intention is not making money, but supporting science. Apart from the starting capital, in 2013 we also received a grant from Google through their Grants for Non-profits Program. The grant amounts to 120.000 USD per year, for an unlimited period of time (basically as long as Google doesn’t change their mind)”. “The constellation in which the University is the applicant and we are a third party doesn’t work. […] We are the creators of the concept. The idea this work can be simply outsourced wouldn’t work for many reasons. It is not possible to simply write up the specifications and give it to someone”. “The “Gemeinnützigkeit” alone is not sufficient to establish eligibility. The DFG would require from any eligible institution that it provides a basic funding to carry out research or infrastructure projects from that funding – with employees of its own. Moreover, the funding needed to be provided on a regular basis (not on a one-off basis). Finally, we must be sure that the organization will exist for a number of years, at least for a minimum number of 10 to 15 years”. “Apart from the Google grant, there is no regular income, and although you state that there may be no time limit for this grant, Google could already change its mind tomorrow. Furthermore, if you compare this ‘regular’ income with the money that you hoped to receive from the DFG proposal, you easily realize that your proposal asked for twice as much money per annum as your basic funding is (assuming for a moment the Google grant is your basic funding; the proposal amounted to ca. 665.000 € for 3 years). This rather strange relationship also underlines our assumption that LSN is not eligible with the DFG. I can understand that you are reluctant with regard to the idea that LSN would only act as a kind of “service provider” to an eligible university, given that you created the concept. Since you do not want to take up that suggestion and since LSN is not eligible with DFG, you may need to go looking for other funding sources to realize your plans”. When I was making my inquiries with DFG in January 2016, the PR official Marco Finetti wrote that the decision to exclude LSN from funding application was made not only by the DFG, but that it was also “checked and confirmed by a member of the responsible board for scientific libraries and information systems”. Finetti however refused to name this reviewer, due to confidentiality. I asked him if the DFG’s insistence, that LSN can only participate as a paid external service provider, would not mean that LSN would lose its non-profit status and that its manager Piljic would be forced to renounce all his intellectual property rights on the project. “We already explained the applicability of individual scientists as well as the non-applicability of LSN in this specific case. We do not see what you declared as “unclarities” as such”. Finetti also very politely told me that he does not want to be contacted on this matter ever again. Prior to this, Fournier informed me by email, which projects were funded by the Open Access Transformation call (see below). The DFG’s vision of future is apparently to flip the academic publishing from subscription to author-pays Gold OA. DFG gave €629,000 to the project INTACT, which is set to manage the costs of author-paid OA publishing. The project “Opening Scholarly Communication in the Social Sciences” received €460,000 to convince social scientists to publish their papers in OA and in an internet-searchable form. DeepGreen was funded with over €440,000 with the purpose that “the main share of those publications, which were negotiated with publishers to go online as green open access, can also be finally made available online”. Almost €680,000 went into flipping a small medical journal “Methods of Information in Medicine” from subscription to open access. The great flipping to OA can begin now. Bewilligt an die GESIS mit einem Fördervolumen von 190.000 €. Bewilligt an ein Konsortium von Antragstellenden aus KOBV Berlin, TU Berlin, GFZ Potsdam, BSB München und UB Erlangen-Nürnberg mit einem Fördervolumen von 442.000 €. Bewilligt an ein Konsortium aus Universität Bielefeld, UB Bielefeld und Max-Planck-Digital Library mit einem Fördervolumen von 629.000 €. Bewilligt an Universität und UB Münster mit einem Fördervolumen von 460.000 €. Bewilligt an ein Konsortium aus GESIS und Universität Bonn mit einem Fördervolumen von 341.000 €. Bewilligt an die Universität Braunschweig mit einer Fördersumme von 668.000 €. The cartoon above applies in general to any research funding. The probability to win a grant is much higher if you are a big player. However, let me play the devil’s advocate. I don’t know Drs. Benjak and Piljic, and perhaps their proposal is impeccable. However, if they don’t have a large network and a bulldozer attitude, perhaps they cannot succeed in implementing their SPLICE project nation-wide.